All pilots have to earn their wings. Including online gamers who want to pilot their way to a big nest of winnings. 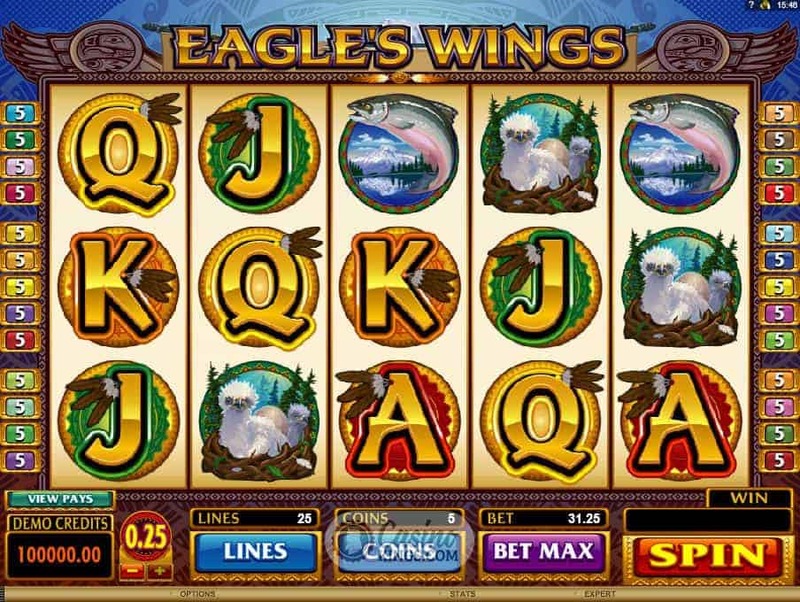 Tenuous references aside, any gamer who fancies themselves as a fly boy or girl should have a crack at Microgaming’s Eagle’s Wings online slot. Though in no way, shape or form is it about flying in the airforce. It is about those majestic creatures that inspired humans to take flight in the first place – the great eagles of North America. I like a slot soundtrack as much as the next gamer. Eagle’s Wings grabs you from the off with an upbeat pan-pipe medley that will have you with your arms our preparing to soar across the Rockies. The game design is as captivating, right from the intro to the attention to detail on the game’s artwork. Check out the super cute glint in the Baby Eagle’s eye, or the look of sheer dread that grips the leaping Rainbow Trout. 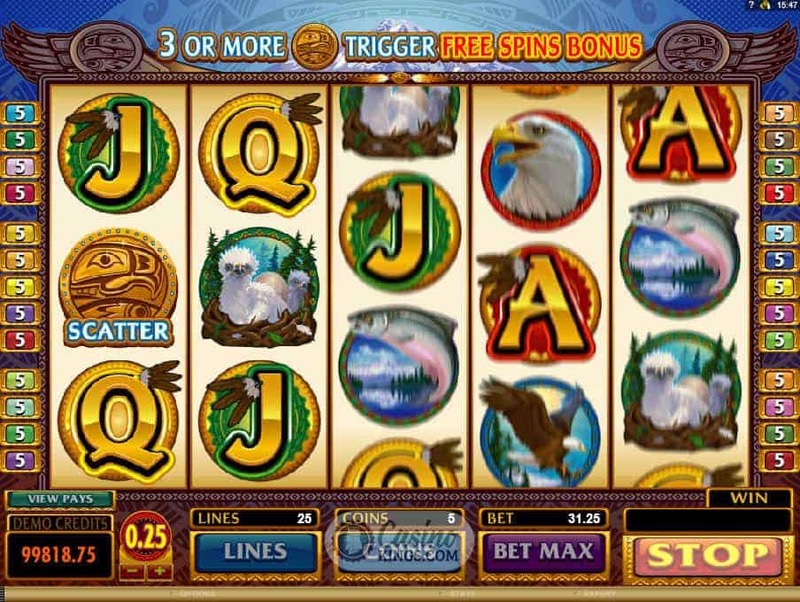 Microgaming have again managed the finer nuances of this online slot to create a perfect in-game atmosphere of the Rocky Mountains and the habitat of these great creatures – an atmosphere that rubs off on us as much as the prize winning potential. The Game Logo is fitting as our Wild, and spreading out like the wingspan of these great eagles it can swoop in as a Stacked Wild, doubling all our wins when substituting. It is also our top-paying symbol, landing us 1,000 coins when we land five of them across any winner of the game’s 25 paylines. But the real gold on offer for us is brought ever closer by the Lucky Eagle Coins that are our Scatters. 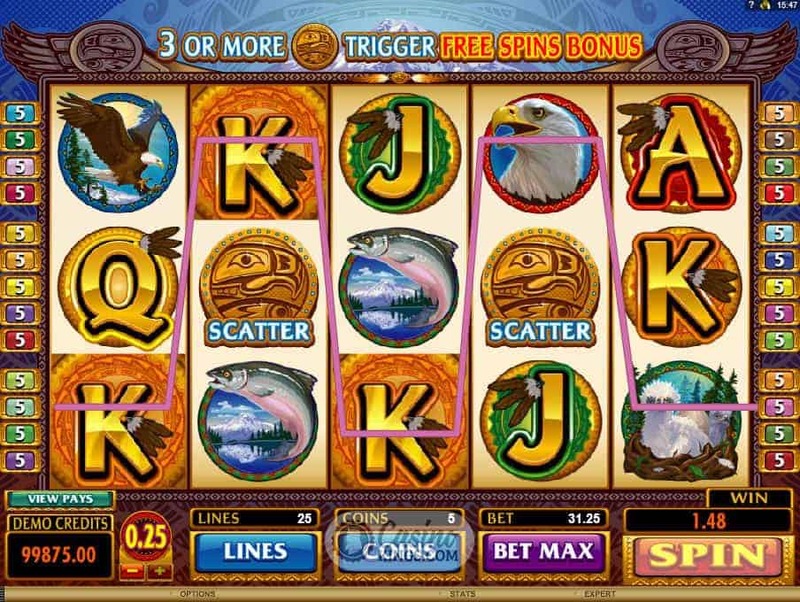 Landing three or more of these ancient-looking coins will trigger the game’s Lucky Eagle Bonus feature, in which we must first choose a selection of Lucky Eagle Coins to discover our spin reward. 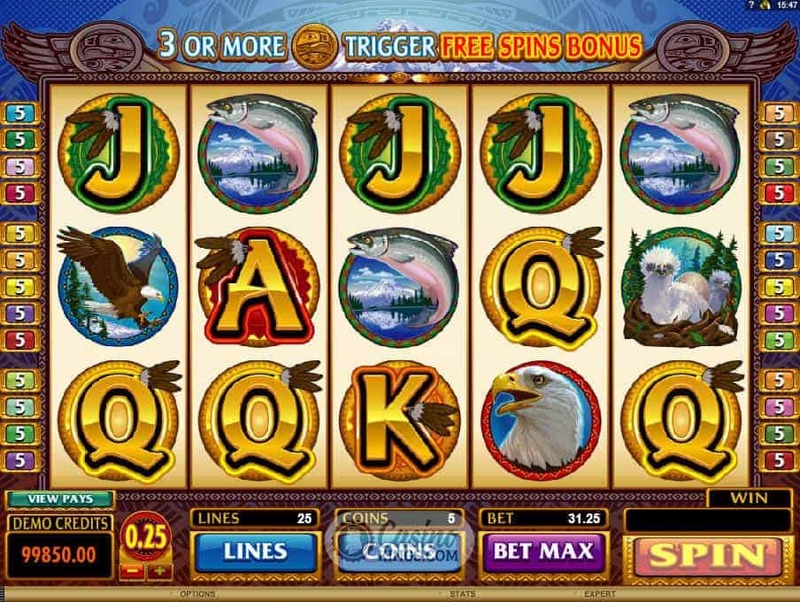 Here we circle over a potential 60 free spins, all with a 3x multiplier to take back to the nest with some birds. Although coming pretty early on in the Microgaming catalogue you don’t need super strong eyesight to see that this title offers plenty in terms of gameplay and bonuses. You don’t even need a love or appreciation of these great creatures, but just a few spins of these five reels will pretty much see you right with these feathery friends. As long as they don’t peck your eyes out.